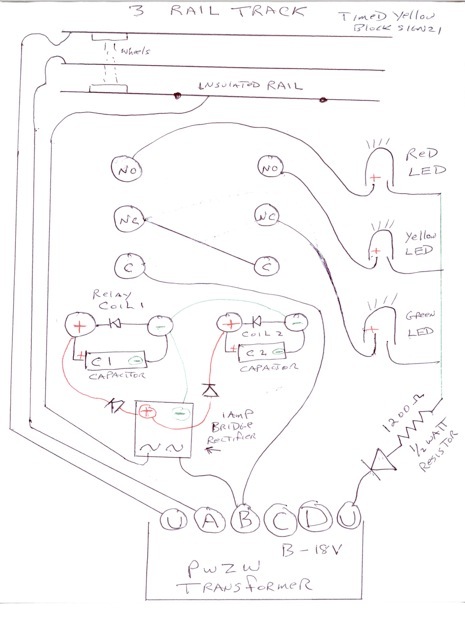 However I was asked for a circuit which will give a timed yellow for a block signal with 3 LEDs, red,yellow and green. This can done easily with 2 SPDT relays,some diodes and 2 capacitors. The diagram below shows a hookup for a PWZW. But can be used with most any transformer with an accessory tap. The diode off the U of the transformer provides half waved rectification for the 3 LEDs. The half watt carbon resistor,1200 ohm or more protects the LEDs from over current. Larger values can be used to dim the LEDs if they are too bright. For block signals using light bulbs these could be omitted. Diodes across the relay coils are for spike suppression. The 2 diodes off the + of the bridge rectifier prevent the capacitors from sharing. 1n4001 or similar diodes are fine and cost a few cents each. Note how the relay contacts are wired. In operation,if both relays are off,the LED is green. If relay 1 is on and relay 2 is on or off the LED is red. If relay 1 is off and relay 2 is on the yellow LED is lighted. The B tap of the ZW is shown powering the relays and the LEDs but the C tap could also be used to power the LEDs separately. The relay coil circuit is completed by the outside insulated rail method. (The train wheels complete the coil circuit whenever 2 or more pair of train wheels occupy the block) The relay coils can be 12 or 24VDC. For 12 volt DC relays the B tap would be set at 9 to 10 volts. For 24VDC coils the tap could be set at 18-20 VAC. I recommend 24VDC coils as they will not be accidentally burned out if the throttle is mistakenly pushed up too high. The 1 amp or more bridge rectifier provides rectification for the DC relay coils. Capacitor 1 across relay 1 can be small 100 uf ,220 uf for example. The purpose of capacitor 1 is anti chatter and smoothing out the pulsed DC current to the DC relay coil. It charges the pulsed current to peak,voltage is increased by 41%.. So the 18 VAC becomes a perfect 24 VDC filtered with the bridge and capacitor. 10 VAC would become 14 VDC. So be careful if using 12 VDC relays. Attention should be paid to the polarity capacitors,as well as diode polarity. A backward diode will not conduct,or across the coil cause a short circuit. A backward capacitor will explode and make a smelly mess. When the train wheels occupy the insulated rail section. both relays energize and stay that way until the train leaves the block and the capacitors discharge. But relay 2 will drop out after relay 1 if capacitor 2 is larger and stores more energy. Capacitor 2 across relay 2 coil now has the added function of being a timing capacitor. When charged it stores electrical energy and will hold open relay 2 when power is removed (when the train wheels leave the block) and result in the yellow LED staying lighted until the capacitor discharges,only then will the block signal will return to green. The amount of time depends on the characteristics of the relay coil (resistance in ohms) and the amount of capacitance. For a typical relay this is about 1 second per 1000 uf of capacitance. So a 4700 uf 35 volt one would give perhaps a 4 to 5 second yellow. For best results use relays with higher coil resistance,240 ohms or more. Avoid 12 volt automotive type with 88 ohm coils. Capacitors from 1000 to 10000 uf can be tried. 2, 4700 uf ones can be wired in parallel to get that value. High value capacitors,such as the ones used on relay coil 2 may induce some arcing on the outside train wheels when they first roll into the block and complete the circuit. This is due to the large inrush of current when the capacitor first charges. If this is a problem,simply install a half watt carbon 18 ohm,or 33 ohm or similar low value resistor in series with one of the leads to the capacitor. This is not shown in the drawing. Some people asked about what relays to use. There are so many to choose from and go into. In this application the higher the resistance of the coil the less capacitance is needed for the timing relay. In this case if only block signals are to be switched, you can use signal relays. This type relay usually has a high coil resistance and trades off switching capability. Here is one in the 24VDC version with a 3840 ohm coil. A 1000 uf capacitor across the coil should hold it in for (my guess) about 5 seconds or more. You would have to experiment with values. The formula for discharge is 1.1 times resistance times capacitance. So 3840X1000 divided by 1 million is about 4 seconds. Usually they hold in a bit longer than calculated. Note for the left relay,instead of 220 uf you could use a 10 or 22 uf one. All capacitors should be rated 35 volts or more. The contacts are rated at one amp,enough to switch LEDs or a single light bulb. If using this type of relay make sure you protect the switched circuit with a 1 amp fuse or poly fuse. This site does not seem to allow links so you can copy and paste. Here is one of many of such type relays. They are PC mount so you would have to do bit of soldering and use a barrier strip for easy hookup. Dale thanks for this detailed explanation and schematics. What a wealth of excellent information you have shared with the Archive, we sure appreciate it!